A comparative pharmacological investigation of ashwaganda and ginseng. 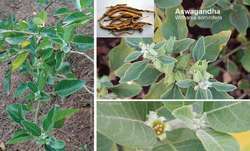 ASHWAGANDA (Withania somnifera) is an Ayurvedic remedy widely used in Indian medicine and often known as Indian Ginseng. Herbs from the Indian ginseng ashwaganda and the Japanese reishi for motivation, to ginkgo biloba for improving concentration, to hops and passionflower to induce relaxation are all part of the 'mind medicine' chest. For instance, I will often use a botanical such as ashwaganda or a pure source adrenal supplement like neonatal bovine adrenal cortex, at the same time using an adaptogenic thyroid supplement. My favorites are tinctures of Rhodiola, Eleutherococcus senticosa, or Ashwaganda (Withania somnifera). Effect of ashwaganda on lipid peroxidation in stress induced animals. Additionally, Sabinsa produces ashwaganda extract, which "strengthens the body's defense system to guard itself from the stressors that can affect the immune system. Most cases of adrenal fatigue also have low DHEA, which can be increased by supplementation, stress moderation, recreation, and Ashwaganda. I recommend a broad range of adrenal supplements for this purpose, including adaptogens such as rhodiola, Cordyceps mushroom, ashwaganda and Researched Nutritional's Multiplex and NT Factor Energy. Withania somnifera, or ashwaganda, is an Ayurvedic herb. Indian herbs such as shatavari and ashwaganda that relax the central nervous system and enhance brain function promote a meditative state ideal for connecting with spirit.